Competed in the Area Level contest (Areas 75, 76, 77 & 78). 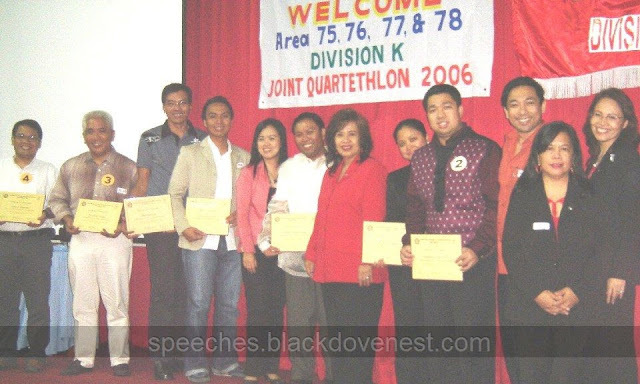 A Quartethlon is a local Toastmasters contest of 4 events: Prepared Speech, Evaluation, Impromptu Speaking and Singing. Contestants do all 4 events. This was held at the Mini-Theater of the Lopez Bldg, Meralco, Ortigas. 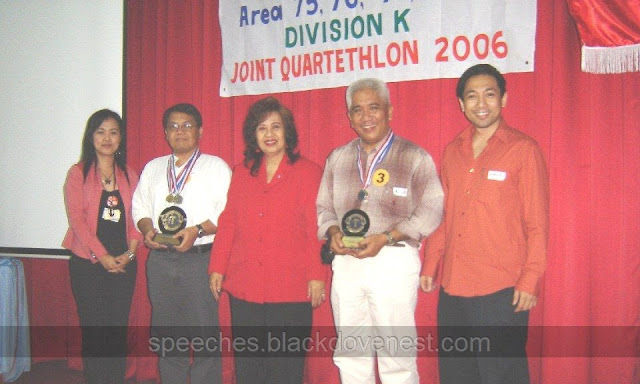 (Left-right: Les Aquino (ON Semiconductor), Arnaldo "Aldo" Tayao (Meralco South), Marty (Proctor & Gamble Cabuyao), John Paul de Guzman (Diageo), Area78 Governor Bobbie Galang, Roel Macarrubo (Philips Calamba), Division K Governor Rema Manzano, Dang (Exel), Voltaire Victoria (IAME), Area77 Governor Khris Albano, Area75 Governor Lolet Gabay and Area76 Governor Beth Pableo. Here are the winners for Area 78 with Area Gov. Bobbie Galang: Area 78 Champ Les Aquino and Runner-Up Arnaldo Tayao. Chief Judge for this event was Pam Castro and the other judges included Gina Mapua and Jimmy Pamintuan. In the Impromptu Speaking Category, the topic given was: "The Road to the Head is through the Heart." I won the Runner-Up award in this category. In the Evaluation Speech, TM Linda Lagera from Bloomfield Academy was the Test Speaker and her speech was entitled, "To Be or Not to Be - A Toastmaster". It was an uplifting story of her challenges and triumphs in Toastmasters. For the Singing Contest, the theme for this year was "60's and 70's Rock 'n Roll". This category was highly entertaining and everybody enjoyed it as the contestants sang AND danced to their pieces. For Area 78, Dang from Excel sang "Happy Together"; Marty from Proctor & Gamble Cabuyao sang "Twist and Shout"; Aldo from Meralco South sang "When I'm Sixty-Four" and I sang "You Can't Hurry Love". I won the first place for Area 78 in Evaluation, Singing and Prepared Speech. Below left: Me (contestant #4) arriving home and wearing the medals for the last time before storing them away. Below right: The trophy as Area Champion. Runner-up in Impromptu Speech, Champion in Evaluation, Singing (yes, singing!) and Prepared Speech. There are four categories, hence the contest is called Quartethlon. Here's a denim vest as part of the costume I wore for the Singing category. I affixed sequins to it on front and back. Not shown are the cool sunglasses, colorful bandana, rugged long-sleeved shirt and a huge medallion. With the theme "Rock-and-Roll of the 70's", I sang and danced to "You Can't Hurry Love" by Phil Collins (also sang by Supremes). Play the video below to hear it. Winning the Area contest advances me to the Division Level contest.